High Treason is a 1928 film based on a play by Noel Pemberton Billing. 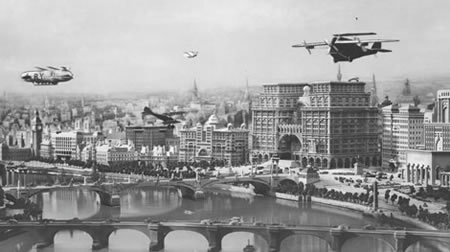 Set in the London of the “future” (the 1950s), the film features cigar-shaped cars and airships over a skyline rather more like that of New York City. The plot resolved about a “Peace League” battling a band of evil agitators while the world’s superpowers stand on the brink of devastating war. Perhaps more “retro-futuristic” than steampunk (even though there’s dirigibles there! ), the film provides an intriguing glimpse into what seemed possible during the Interbellum. As a past projection of the future, it should be of interest to any steampunk enthusiasts, if only because we learn that combat gear of the future includes high heels! 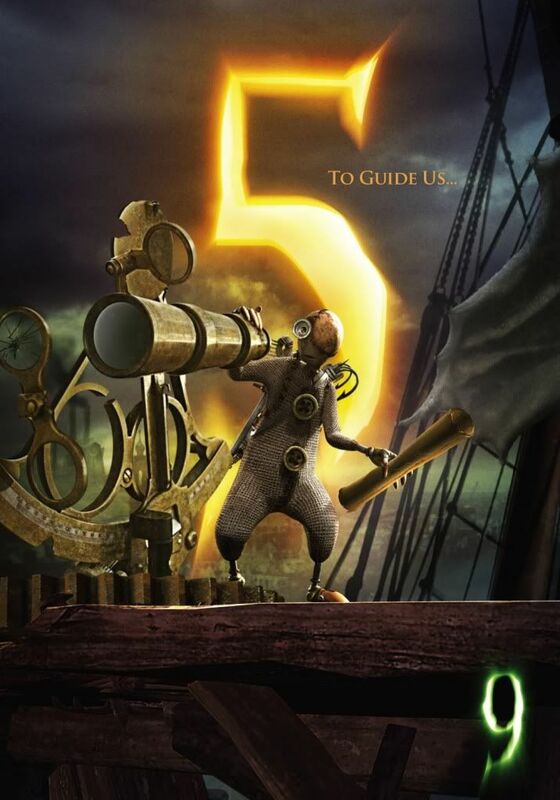 About 5 Voiced by Academy Award nominee John C. Reilly, 5 is a caring, nurturing engineer – the loyal, big-hearted “common man” who always tries to play the peacemaker. He is also an apprentice of 2, with whom he shares a special bond. Can’t get enough of 9? – Meet the Scientist at Facebook.com/9Scientist – Explore the Scientists Lab at 9Experiment.com – Watch the trailer at 9TheMovie.com – Visit on your cell phone at 9.msite.tv – Sign up for mobile alerts by texting ‘9″ to 4FOCUS (436287) – Be sure to download the reader by texting ‘READER’ to 4FOCUS (436287) so you can decipher the secret messages on the street and gain access to exclusive content! – Secret Tip: Comic Con 2009! 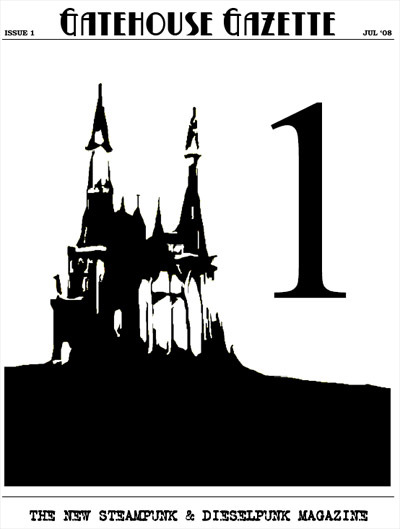 Be sure to stay alligned with this transmission for further tidbits from this film! “The new steampunk & dieselpunk magazine” is here with the release of the first issue of the Gatehouse Gazette. In this first issue, the reader with find an introduction to the genre of dieselpunk by Piecraft and Ottens, an interview with Toby Frost, author of the steampunk-in-space novel, Space Captain Smith, an article about the gentleman in modern times by Delphinius Tucker, steampunk fashion and couture by Hilde Heyvaert, a review of the latest Indiana Jones film by Jack Rose, steampunk poetry, essays, cartoons—and more! 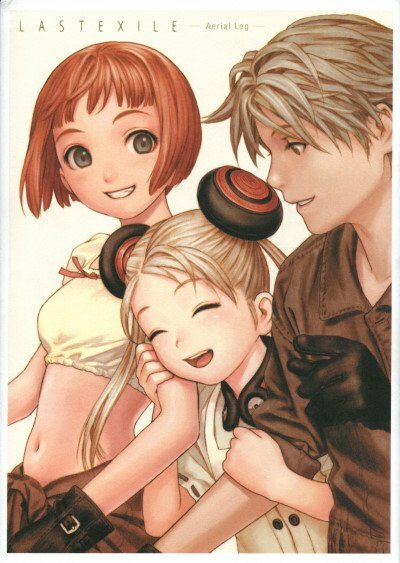 Having noticed that our fearless leader had previously mentioned Last Exile but hadn’t had time to view the whole series, I took it upon myself to sit and observe so that I could provide a concise review to you, my fellow Brass Gogglers. Bioshock – by many regarded as one of the best first person shooter games ever made, is a game available for PC and Xbox 360 which was discussed at length at the Steampunk Forum upon release. 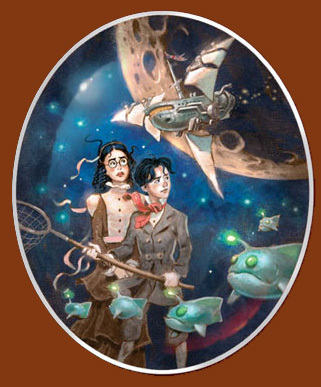 Since the story is set in an alternative 1960 in an underwater city built in 1946 it’s strictly speaking not at all Steampunk – more art deco, but with a lot of steampunk flavour added by the dystopic atmosphere, odd gadgetry, mad science and of course the design of the Big Daddy diving suits. Universal has recently embarked on a project to turn the game into a motion picture, enlisting Gore Verbinski (Pirates of the Carribean, The Ring) at the helm. Mr Verbinsk has announced he wants John Logan (The Aviator, Sweeney Todd, The Time Machine) to write the screenplay and the filming is to begin as soon as the screenplay is finished. 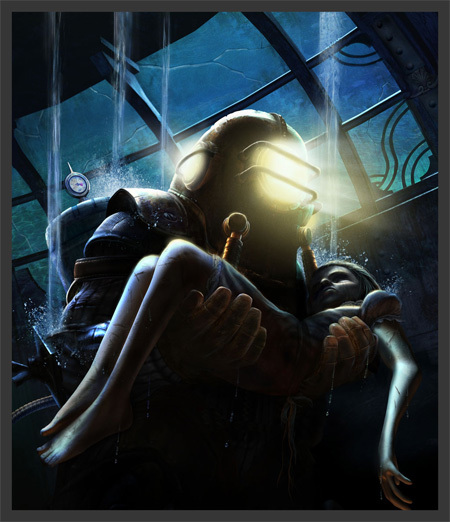 For those unfamiliar with the plot of Bioshock it’s basically about exploring the underwater city of Rapture in search of it’s founder. Rapture is a society ruled by the objectivist principles of Ayn Rand, a once thriving laissez-faire capitalist paradise now emptied following a civil war. The storyline has also borrowed elements from Ayn Rand’s fictional work. I’m rather a big fan of the young person’s series of Steampunk books by Messers Reeve and Wyatt, known as the Larklight trilogy, so it is with great excitement and no small amount of crossing of extremities that I hear that the filming for the first book in the series, Larklight, has been given the green light, a budget and a director! Mr Shekhar Kapur (director of Elizabeth and the sequel, Golden Age) has been signed on with a $200 million budget to bring it to the silver screen – a not insignificant amount of money, I hope you’ll agree. Thank you for pointing it out, Jwlphoto! I’m not dead! I apologise for being absent so, but it’s back to pleasure as usual and I’d first like to mention that when I was in New York (for the Dances of Vice festival, more on that later) I was fortunate enough to get tickets to see the musical Wicked on broadway. Oh, such a beautiful show! Telling the tale of the Wicked Witch of the West, the Good Witch Glinda and many more non-Dorothy characters from Oz, and I honestly hadn’t gone there with the expectation of anything Steampunk. However, I was very pleasantly surprised – from utterly delicious pseudo-Victorian Emerald City costumes (that you can see blurrily in the video above) to the ominous and threatening influx of dangerous science and more cogs than I could shake a magic wand at! The sets featured sillouetted iron bridges, giant backlit gothic clockfaces, and a wooden clockwork dragon overseeing the whole beautiful affair. The Wizard of Oz’ mechanical giant head is also has to be seen to be disbelieved! I’d heartily recommend seeing it if you can (New York, Chicago, LA, London, Tokyo, Stuttgart, and Melbourne) and if you don’t come away with a hankering for green lensed glasses/goggles, I’ll be somewhat surprised. And novel it is indeed! La Mécanique du Cœur, by the French rock band Dionysos, is both a novel and an album of accompanying songs, telling the tale of a young boy from 19th Century Edinburgh, born with a heart so cold that his witch-midwife replaced it with a clockwork one, so that he may live. A sad tale of Steampunk, then. The video above is what clinched this for me, however, beautiful animation with a faint “Nightmare Before Christmas” feel to it, with the unfortunate young man finding that a clockwork heart can break just as easily as a real one. More animated cogs than you can shake a beautifully designed pagoda parasol at, and a particularly sad ending to this miniature narrative. I do not know what they’re singing, but I do not mind terribly – it’s perhaps even more lovely because of it. Thank you so very much to Mr Martin for pointing this out – and you can read much more about it at the Filles Sourires blog. Over at the forum, the talented Mr Smaggers (you should see his Death of Rats) posted about this short video on YouTube at the moment – showing a “What might have been” if the internet had arrived somewhat earlier than it actually did. Marvel as people make a fool of themselves on YouKinetoscope, chuckle cruelly at the antics of a Valiant Knight of the Aether as he waves his light-stick around, and other, strangely familiar events. You may get a little bored during the first few moment, as unless you have a pipe-interest bordering on the unhealthy, the initial series of tubes does drag on. Quite amusing, very silly, but harmless fun and well done by the creator! While Stardust, the film, may be out in the US, I must wait a little while longer before the airship of Captain Shakespeare can brave the skies of the Atlantic and bring it to the UK shores. However, in the meantime, I can amuse myself with the background information about the antics of the air pirates, and what it is that they actually do. 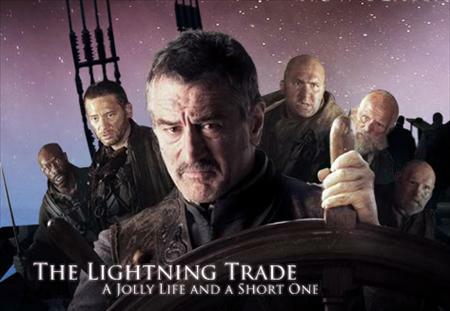 They harvest lightning, for the black market (of course). It’s a simply fantastic idea (literally), and the airship seems to have webs and vanes of metal attached to the sides to act as lightning rods to collect this powerful side-effect of nature which they store in a jar. (Leyden, perhaps?) I’m still looking forward to this, and if anyone over the ocean has managed to catch this, please feel free to let me know in the comments what you felt of the film – though preferably with as few spoilers as possible. Thank you!